Hi Y'all! I hope everyone enjoyed their Labor Day Weekend! I certainly needed the extra day of rest. In a recent post, I talked about my discovery of Whole Brain Teaching. I have implemented WBT in my classroom, and have found the results to be astounding. My students are so well behaved and well managed that I can spend all of the time actually teaching! While WBT has a ton of freebies on their website, including posters and practice cards, you know I always like to give my own flavor to things. So, I created my own wall poster, rule anchor charts, and practice cards. 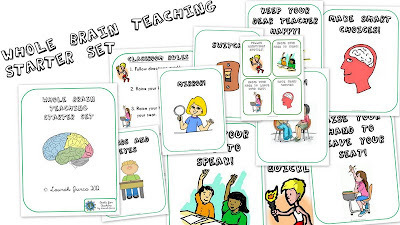 Since Whole Brain Teaching is © Chris Biffie, I have made this Whole Brain Teaching Starter Set available to you for FREE in my TpT store. Here's a preview! Just click the button at the end of the post to download them from my TpT store! If you're using WBT in your classroom, please comment and let me know how it is working out for you!